Respondents rate the level of value attained from purchasing cards across a variety of financial and process-improvement measures. Users identify purchasing card to be most preferred among other payment methods across various payment criteria. The Report highlights that the value attained from purchasing cards is largely driven by the actions of management in the categories of acceptance, control, and (use of) technology. The growth of purchasing cards is discussed between 2014 and 2016, and as projected through 2021. Factors influencing growth are measured including: the adoption of EAP (or virtual cards), mobile technology used in the procurement process, and the use of cards within e-procurement software. Key benchmark statistics are provided for purchasing card programs, such as: Monthly spending per organization, per employee, per card, and per transaction; monthly transactions per card, the card-to-employee ratio, and the percentage of transactions of differing amounts paid by purchasing cards. The value created by purchasing cards is documented by way of staffing reduction/reassignment, transaction cost savings, cycle time savings, vendor discount improvement, increases in working capital, increased spend transparency, rebates, and elimination of petty cash accounts and cash advances. Additionally, the value created by purchasing cards can have a direct financial impact on a corporation’s net income and market valuation. The current level of purchasing card use among various categories of goods and services is assessed, as well as the potential for greater card spending (and associated benefits) through the capture of more spending categories and a larger percentage of spending within each category paid with cards. The current level of EAP adoption is discussed, as well as its impact on purchasing card programs, and the potential for market expansion. The level of supplier acceptance of purchasing cards is shown via the number of suppliers and the percentage of an organization’s supplier base paid with card. Additional topics include: (a) the impact of increased card acceptance, (b) card benefits received by a supplier for a p-card transaction for use in acceptance negotiations, (c) actions taken by respondents to incentivize suppliers to accept cards, and (d) enablement strategies in place and their impact on p-card programs. The Report also discusses purchasing card use with suppliers outside of the U.S. and Canada. 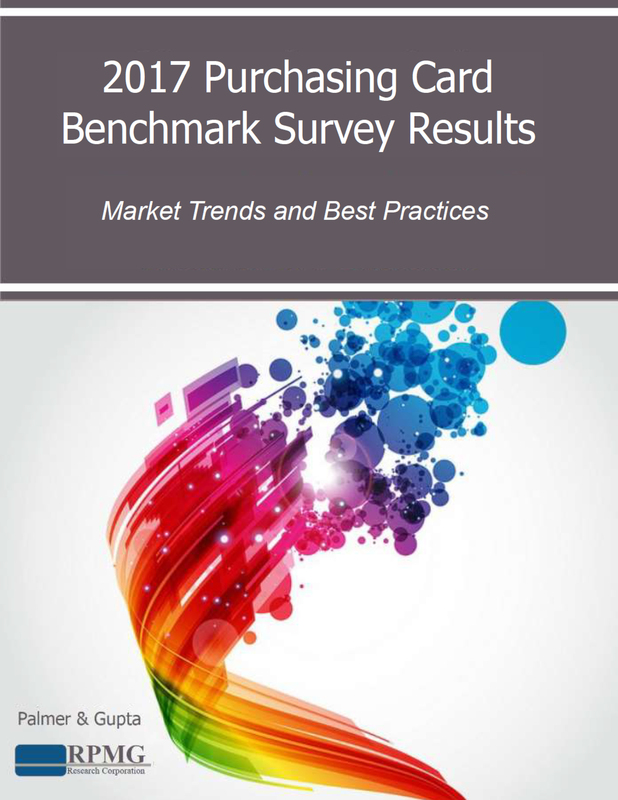 The 2017 edition of the Purchasing Card Benchmark Survey examines best practices of outstanding purchasing card programs and sheds light on continuing market trends. Specifically, the report includes the impact on card programs from card distribution, spending limits, mandates, supplier enablement strategies, technology integration, expanded card toolkit options, and more. Simply put, greater card benefits are derived from greater card use. A set of nine action items are provided to assist struggling programs in improving their use of p-cards and obtaining the promised card value. Common barriers to p-card program growth and expansion are observed, as well as suggestions to overcome them. The prevalence of “one card” programs (one card used for all business expenses including travel) and its impact on organizations is examined, as well as the current status of card programs, other than p-card, in place. As in previous years, the level of card misuse (policy violations, fraud, and misrepresented business spending) is assessed. The Report shows the prevalence of card misuse to be very low, and its impact to be financially insignificant compared to the cost savings and benefits derived from p-card use. Respondents provide some actions taken to reduce the potential for card misuse.